Sida cordifolia is herb to treat broad variety of ailments such as bronchial asthma, cold and flu, chills, lack of perspiration, headache, nasal congestion, aching joints and bones, cough and wheezing, and fluid retention in body. Bala (Sida cordifolia) is a valuable medicinal herb of Ayurveda. It is a useful herb to treat broad variety of ailments such as Vata roga, Pitta roga, bronchial asthma, fever, dry cough, nervous debility, infertility, emaciation etc. Bala is used in formulation of medicated oil for treating joint pain, swelling and massaging. This medicinal plant is distributed throughout tropical and sub-tropical India and Sri Lanka. It is a perennial shrub with long branches. In Ayurveda, leaves, seeds and roots are used for medicinal purpose. Bala is also used as a primary ingredient in massage oils which are used applied externally on arthritis, joint pain, paralysis and other Vata Roga. There are four varieties of Bala mentioned in Ayurvedic Texts namely, Batyalaka (Sida cordifolia), Mahabala (Sida rhomboidea), Atibala (Sida rhombifolia), Nagabala (Sida alba). The roots of all Sida plants are considered cooling, tonic and astringent. The roots are prescribed in the treatment of fever, urinary and nerverous diseases. Plant Description: Much branched undershrubs, branchlets densely stellate-tomentose. Flowers: Small, yellow or white in colour, solitary and axillaries; Calyx campanulate; lobes 5, triangular, densely pubescent outside. Petals 5, pale yellow. Stamens monadelphous. Fruits: Loculicidal capsule, with 8 – 10 strongly reticulated mericarps, ciliate on the upper margins. Plant flowers from August to December and fruiting from October to January. Distribution: All over India and Sri Lanka, commonly found growing as a weed along the roadsides. Scientific name: Sida cordifolia Linn. The botanical name of Bala is Sida cordifolia. It belongs to plant family Malvaceae. Below is given taxonomical classification of the plant. Sida cordifolia is rich in medicinal properties. The understanding of these properties will help us to better utilize this herb. These also indicate the conditions in which we should avoid it. CNS-Depressant: Slow brain activity. This property makes them useful for treating anxiety and sleep disorders. Sida cordifolia is known as Bala in Ayurveda as it is Balya and gives Bal or Strength. It is a sweet tonic that builds body. Bala is sweet and nourish the deeper reproductive tissues. Bala is sweet in taste (Rasa), sweet after digestion (Vipaka), and is cool in effect (Virya). It is a Sheet Virya herb. Sheet Virya or Cool potency herb, subdues Pitta (Bile) Vata (Wind) and increases Kapha (Mucus). Sheet Virya herb gives nourishment to the body and steadiness. It supports the building of the body fluids. In excess, Bala can increase Ama. It is Madhur Vipak (digests into sweet) and has building, moistening and a nourishing effect on the body. It is heavy to digest and reduces metabolism. Such herbs are cooling and reduce swelling, decreases Pitta and have Anabolic effect on the body. Balya: Strengthens body, tonics. Such herbs are usually heavy and filled with the earth element. It is a nourishing tonic, especially for nervous conditions. It balances tridosha i.e. Vata-Pitta-Kapha. It mainly clears high Pitta and Vata. It is beneficial in urinary problems such as stones, stones, infection, haematuria, polyuria etc. It gives relief in painful nervous disorders such as neuralgia, sciatica, paralysis and neurosis. It gives strength to the reproductive organs and helps in infertility. It is known to stimulate sexual organs and enhance the male libido. It helps in dry cough, asthma, tuberculosis and haemoptysis. It is tonic for heart. It is Rasayana for all kinds of Vata disorders. It is health tonic with rejuvenating, anti-inflammatory, libido-enhancing and fat-burning properties. Sida cordifolia or Bala has analgesic, aphrodisiac, demulcent, diuretic, nervine, rejuvenative, stimulant, tonic and vulnerary properties. It is main herb for weakness. It gives strength to the body, heart, nerves and muscles. Bala is used both internally and externally. Internally, the roots are administered for emaciation, fever, Vata roga, infertility and many other ailments. Externally, it is good for numbness, nerve pain, muscle cramps, skin disorders, tumors, joint diseases, wounds, and ulcers. Oil prepared using its root is applied. To promote suppuration of boils, abscesses, ulcers etc. and to bring them to a head and break, apply poultice or paste of Sida cordifolia. Seeds, known as Beejaband, are used for this purpose. Leaves are cooked and eaten. The strong decoction of the root of Sida cordifolia (Bala) is given with ginger. the juice of the whole plant pounded with a little water is given. wound, the compress should be kept wet with the juice. The paste made of the powder of the roots of Sida cordifolia (Bala) with honey is kept in the mouth and slowly swallowed. The milk is boiled with roots of Sida cordifolia till all the water has evaporated. This milk is taken with castor oil. 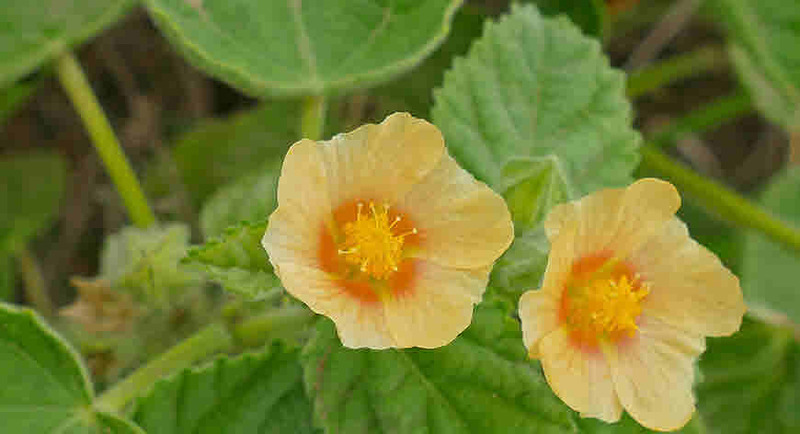 A poultice of yellow-flowered Bariyaara (leaves) is applied to inflammations. The leaves of S. cordifolia with other cooling leaves are applied in ophthalmia. The paste of flowers and unripe fruits and take orally with water. 2-5ml of root juice is taken twice a day. Ghee boiled with the paste of Sida cordifolia (Bala) is repeatedly taken m large quantities after meals. The powder of the root bark is given in doses of 2-3 grams with milk honey and ghee. Balarishtam / Balarishta is taken. The fresh juice can be taken in a dose of 3-6 teaspoon. Sida cordifolia is non-toxic plant. Bala can increase Kapha and Ama if used excessively. Avoid use in Ama Dosha and excessive mucous. Ephedrine may cause irritability and disturbed sleep. Ephedrine can raise blood pressure and in some cases this may be further increased by caffeine. Combined use has resulted in hypertensive crises in a few individuals. Steroids (dexamethasone, by enhancing clearance levels and thus reducing effectiveness of the drug).